Rain gardens are one way for homeowners to use garden design as means to mitigate storm runoff by capturing and detaining water before it leaves our properties. Although these carefully designed gardens function as tiny rainwater detection areas, you wouldn't know it unless they were inundated with storm water. When it's not raining, they are attractive gardens filled with pollinator habitat and native plants with beautiful blooms. Earlier this winter I mentioned rain gardens in this column and many readers have expressed interest in learning more about them. I hope to take a closer look at rain gardens this week to answer folk's questions and give you a better idea about where a rain garden might fit into your landscape. A rain garden is simply a slight depression on the landscape which detains water during storm events, allowing it to slowly infiltrate, or soak in, after the storm. It is filled with native plants which help with infiltration while creating a gorgeous garden space as well. They are constructed at strategic locations in our landscaping that receive storm water runoff from the slope of the surrounding area or the gutters and roofing system of our home. One of the biggest keys to installing a well-functioning rain garden is identifying the proper location. The ideal location is somewhere in the landscape with a relatively small drainage area (< 5,000 sq. ft.) where there is already concern for how stormwater is discharged and the conditions are right for infiltration of water into the soil profile. Additionally, the garden needs to be placed at least 10 feet from building foundations, wells and septic systems. To protect adjacent shade trees, the garden itself should be located outside the dripline of nearby trees in full sun. Although it seems tempting, an area where water already ponds is not a good rain garden site. The fact that water ponds there already indicates that conditions are not right for good infiltration of storm water. Perhaps the soil is compacted or other physical properties of soil in that area do not allow water to infiltrate well? With some careful design, your rain garden can be placed "upstream" of an area where water ponds to intercept some, or all of the runoff prior to ponding. By intercepting the runoff, a rain garden allows time for the water to infiltrate the soil, becoming groundwater instead of surface water that must find someplace to go. Rain gardens capture storm runoff with the use of small constructed berm on the downhill side of the garden. The garden area inside the berm is dug out until level and serves as a pooling area for incoming rainwater. The berm serves as a mini dam, holding back stormwater and giving it time to infiltrate. Although talk of berms and dams do make me think of a pond-type structure, rain gardens are different from ponds since they very ephemeral, drying up shortly after the rain concludes. The berm that is constructed is quite small, often only inches tall. Once the vegetation in the garden is mature, the berm is often nearly undetectable. 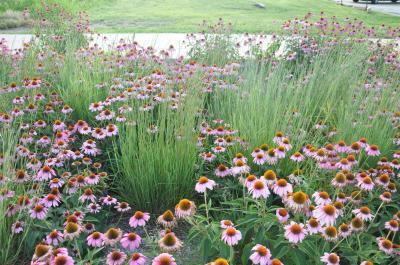 Deep-rooted, native prairie plants are the superstars of rain gardens. Not only do they provide beautiful native flowers and foliage, but their deep root systems aid in infiltration of the rain water. As a storm event begins to fill your rain garden, plant roots begin to absorb and use the water. In addition, all the channels that roots make throughout the soil are conduits for rainwater to enter and infiltrate. It is a well-known fact that roots and organic matter in the soil increase infiltration rates significantly. 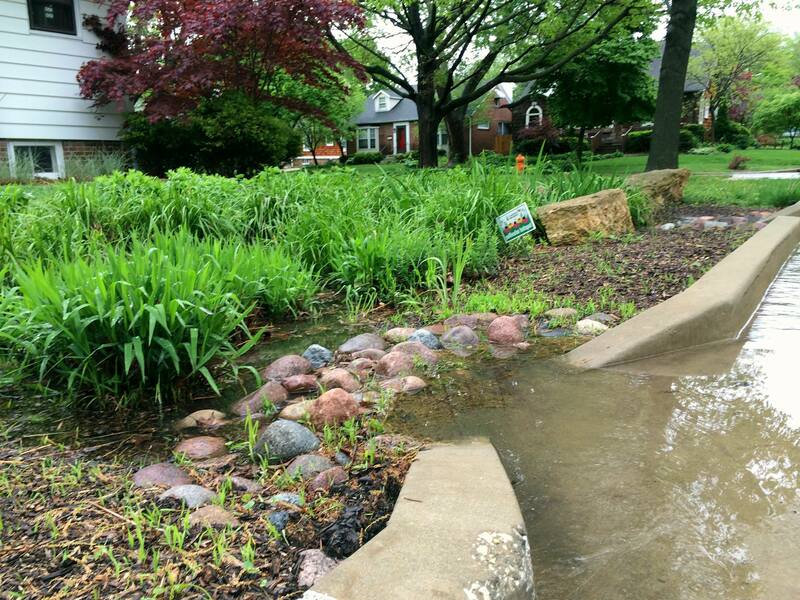 If you are interested in learning more about rain gardens so you can design and install your own, the Wisconsin Department of Natural Resources has a very concise and useful manual for homeowners and landscapers. This guide contains details on how to calculate the drainage area contributing to your rain garden in order to properly size the berm and garden space. It also has great instructions for measurement, layout and installation the garden. 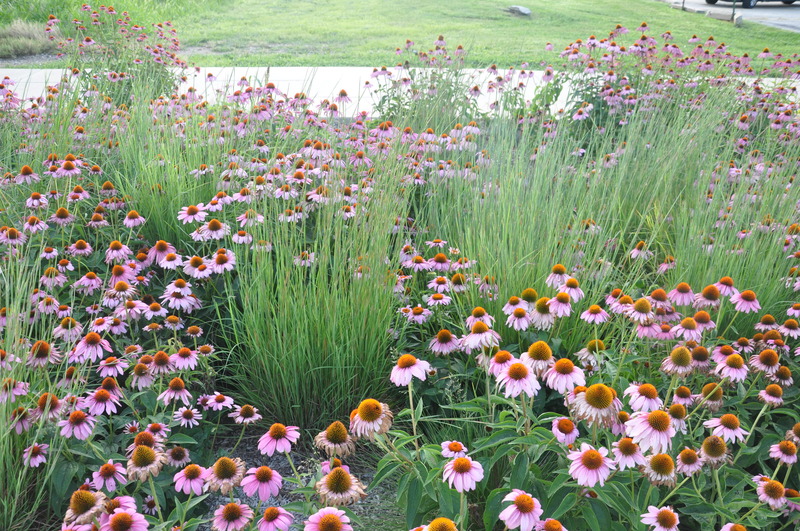 There is a wonderful list of prairie plants that work well in rain gardens with details about the preferred soil type, light preference, height and flowering time of each plant. This guide can be downloaded online at: dnr.wi.gov/topics/stormwater/raingarden.